Global Warming Opens "Arctic Passage"
Frankfurt, Germany: Two German ships have steered through the fabled Northeast Passage thanks to global warming. The melting ice opened a route from South Korea along Russia's Arctic coast to Siberia. Now the ships will complete their journey to the Netherlands through the cold waters where icebergs abound. The ships are carrying 3,500 tons of construction parts. Scientists report that the Arctic Ocean ice cap has been shrinking to unprecedented levels. NASA satellites show that Arctic sea ice is not just shrinking in area, but thinning dramatically. "We are seeing an expression of climate change here," said Mark Serreze from the National Snow and Ice Data Center in Boulder, Colo. "The Arctic is warming; we're losing the sea ice cover. The more frequent opening of that Northeast Passage is part of the process we're seeing. The Arctic is becoming a blue ocean. A journey from South Korea to the Netherlands is about 11,000 nautical miles (12,658 miles). By going northward and using the Northeast Passage, 10 days and about 3,000 nautical miles (3,452 miles) can be shaved off. That means lower fuel costs. This year is shaping up to have the third lowest amount of Arctic sea ice on record, just behind the worst year set in 2007 and in 2008. But just because 2009 is slightly up from the past two years, it is not an upward trend or a recovery, Serreze said. It reflects a change in local weather patterns that occurred in August. 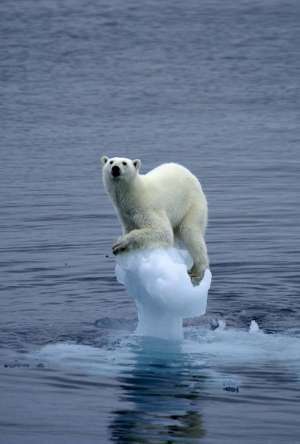 "It's certainly part of the overall decline of sea ice that we've been seeing," he said.